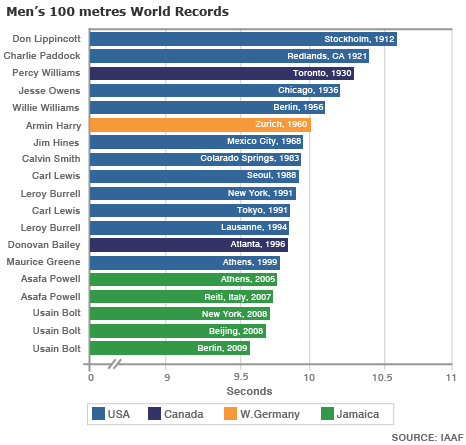 Usain's Bolt's epic run on Sunday night to lower the 100m world record to its current mark of 9.58 seconds is even more impressive when you look further into the statistics. Bolt covered the course - from a standing start - at 23.35 miles per hour. However, he dashed from the 60m to the 80m mark in 1.61 seconds - 27.79 mph. 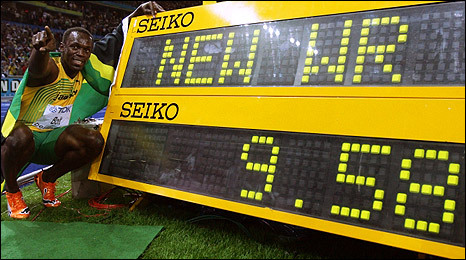 If he could maintain that speed over the whole 100m, with a flying start, he would record a time of 8.05 sec. Britain's Bradley Wiggins was only travelling 7.03mph faster than Bolt when he won Olympic track cycling gold in the men's 4km individual pursuit in Beijing. >> It would be like running 400m in 42.47 sec, taking 0.71 sec off Michael Johnson's 1999 record, or finishing approximately 6.58m ahead of Johnson when he set the mark. >> It is the equivalent of lowering the world mile mark to 3 min 39.49 sec - 3.66 sec faster than current record-holder Hicham El Guerrouj of Morocco and almost 8 sec faster than London 2012 boss Sebastian Coe. >> It would be like getting to the finish of the marathon 2 min 2 sec ahead of Ethiopia's Haile Gebrselassie when he set his world best of 2:03:59 in Berlin last year. At the Olympics in Beijing a year ago, Bolt set a new record in the 100m (9.69sec), before going on to record new marks in the 200m and as part of the Jamaica team in the 4x100m relay. He would lower his 200m record 0.22 sec to 19.08. Jamaica would run a lap of Berlin's Olympic Stadium in 36.68 sec - 0.42 sec faster than they did in Beijing.